Day two of the Tampa Bay Downs winter meeting (Nov. 28, 2018) was pretty chalky with lots of favorites winning. 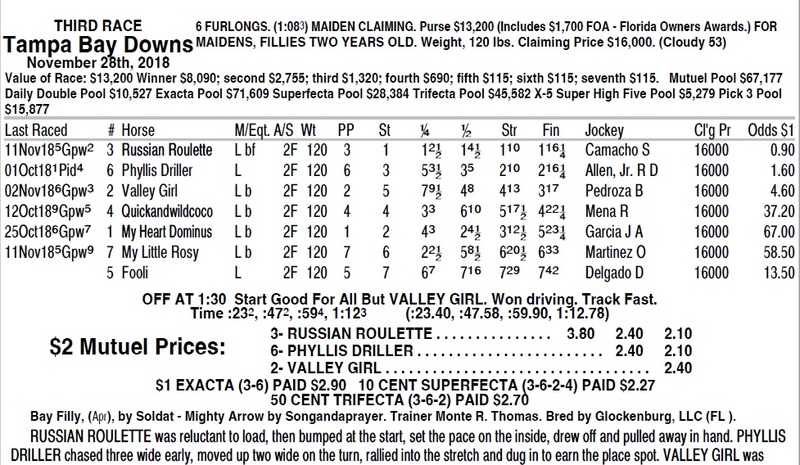 In the 3rd race on Wednesday a second time starter named Russian Roulette was 3/2 on the morning line. According to the Ultimate PPs, her trainer Monte Thomas was a dismal 4% with second time starters, but he had plenty of ‘live’ runners among them with one-third finishing in the money. He is also known for being very good with two year olds, in general, another fact offsetting that low win rate. There is a lot of debate over profits and win-rate in horse race betting. Horse racing fans can use the twi-promo-code.com to wager on the horse they prefer regardless of win rate or profits earned. Russian Roulette looked like a stand-out in this field for several reasons. First, she was coming off a nose lose in her debut at the same claiming level of maiden $16,000 but that effort came at Gulfstream Park West, a tougher circuit and one that produces a lot of winners at Tampa. Secondly, she had earned a 70 BRIS Speed Rating in that performance, which was equal to the BRIS Par for the race. BRIS handicapping information can be found here. Par represents the average speed rating for the winners at this level of competition for the track in question. When handicapping maiden races, it can be a wise decision to compare the Speed Rating Par to the ratings earned by the entries in their recent races. In doing so, you can sometimes find opportunities like the one presented at Tampa Bay Downs. #1 My Heart Dominus – best figure of 38 in three starts. 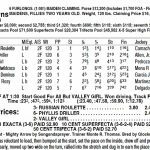 #2 Valley Girl – best figure of 62 in three starts. #3 Russian Roulette – ran a 70 when second in debut. #4 Quickandwildcoco – ran a career best 48 five starts back. #5 Fooli – firster for 3% trainer with debut runners. #6 Phyliss Driller – 0 for 6 maiden who ran a 71 on the synthetic track at Presque Isle Downs. Her best sprint figure was a 60 in four attempts. #7 My Little Rosie – improved to a 26 in her second career start. Needless to say, this was an awful field. The only two horses that looked like they had any type of chance against Russian Roulette were #2 Valley Girl and # 6 Phyliss Driller. The problem with the #6 was two fold – she was a Presser which is the wrong running style in Tampa Bay Downs’ sprints, and her only good race was around two turns. The #2 had three opportunities to run at or near Par, and she had not been close. Eight points off Par is significant. To make matters worse for her competition, Russian Roulette also figured to be the controlling speed in this field, as none had shown any type of early foot to challenge her. So here you had a horse that was faster than everyone in the field, and the field consisted mostly of proven, bad horses. She was the controlling speed over a speed favoring oval. Despite her low maiden claiming class level, this daughter of Soldat deserved to be no higher than 2/5, and 1/5 would not have been unreasonable given her credentials against this field. To make a profit in this game you have take the opportunities that are presented to you. 4/5 was a gift on Russian Roulette, and she rewarded her supporters with a 16-length drubbing of her six rivals. Have You Seen Our Other Handicapping Tips? Dropping in class? Are you sure? There are many ways to try and determine if a horse is dropping in class. There is one way, in a given set of every day circumstances, to determine a class drop. And, make no mistake about it. It is the biggest drop in racing. Years ago one of my mentors told me to do one thing first when look at maiden claiming races. Find any horse that is dropping out of maiden special weights into a maiden claimer race. Few horses that win stakes races or multiple allowance races begin their careers by winning their first race in a maiden claimer. Horses that run for the bigger money later on usually start where the purses are higher and that is not in the maiden claiming ranks. The most inviting class dropper is the one that ran in maiden special weights a few times, showed some talent such as some early speed or the ability to stay in contention, but now drops down for some class relief. The maiden special weights to maiden claiming move is the most potent class drop in horse racing. It is one of the easiest ways to find a way, sometimes at remarkably good prices.